Life was pretty rough for 8Greens creator Dawn Russell, to say the least. Between treating Stage III cancer at age 25, contracting a bone infection after her fourth surgery, and being unable to eat almost anything without getting sick for years, she wasn’t having an easy time. She tried everything from acupuncture to traditional western medicine, and visited top doctors and medical centers, but nothing helped. Even Kermit thinks it’s easy to eat his greens with 8Greens. Well, almost nothing. One food combination seemed to work, eventually changing her life for the better. After five years and 263 different attempts, she discovered the perfect combination of eight key greens that could easily be dissolved in a glass of water or added to a meal and still taste delicious. Spinach. Wheatgrass. Kale. Blue-green algae. Spirulina. Aloe Vera. Chlorella. Barley grass. Try putting some in a jar to share with friends and neighbors—or to freeze for a day when you’re not feeling so great. effervescent pill that contains no sugar, a mere 9 calories, and more healthy greens than you’d ever think one little tablet could handle. According to Russell, 91% of Americans aren’t getting their recommended amount of veggies each day, but 8Greens makes this goal a lot easier to reach. 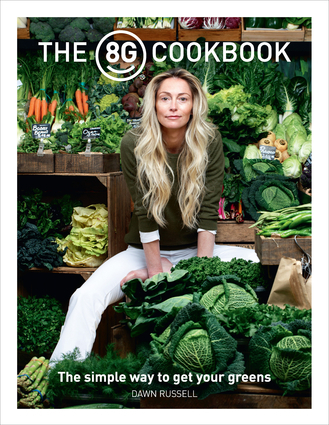 We received some of the 8Greens tablets at our office, along with The 8Greens Cookbook. My colleagues Bridget, Leanna, and Hailey decided to help me out with one of the recipes that fit in perfectly with the chilly autumnal weather we’ve been having: 8Greens Chicken Noodle Soup. We each brought in a few ingredients, making this a definite group effort—but it’s a recipe that doesn’t really need more than one set of hands. As far as difficulty goes, this is a fast and easy meal for anyone on the go. All you really need to do is dump everything in a pot, wait, and when the veggies are cooked, add in the noodles. Once they’re soft, voila—you have soup! For our attempt, we (okay, I) poured in a few too many noodles and ended up adding more broth to even out the ratio, but the end result was still delicious. Who doesn’t want hot chicken noodle soup when they are ill, cold, or feeling the general winter blues? It is like a big hug from mama. Melt coconut oil in a large pan, then add all ingredients except noodles. Simmer over low heat until vegetables have softened. Add dried noodles, then simmer until soft. This soup is as happy to see you as you are to see it! [A note on] Stock—beef, chicken, fish, etc—is a mega healing food that most mommies and doctors prescribe for those under-the-weather, because bone broths are nutrient-dense, easy to digest, and boost healing. Chicken stock in particular contains amino acids that help first thin and then expel mucus in the lungs. Our ancestors used every part of the animal, boiling and simmering marrow, skin, feet, ligaments etc. for days. While it may sound horrid, the simmering releases health compounds like collagen, glycine, and glutamine that have endless benefits, including healing the gut, protecting joints, supporting immunity, promoting metabolism, protecting against food intolerance etc. Thanks to Random House UK and Lady Dawn Russell for letting us share her recipe! What are your go-to healthy recipes? Share in the comments below!